Amazon Alexa is a voice assistant enabled on wide range of Amazon Echo devices. 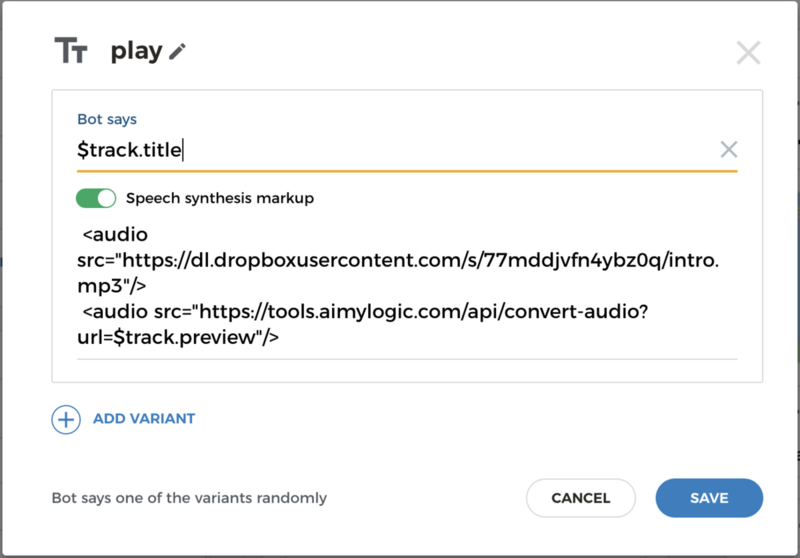 Aimylogic enables you to create voice skills for Alexa connecting your bot to the Alexa Channel. Skill adds voice features to Alexa allowing the user to invoke your service. Please learn more about Alexa skills here. Aimylogic provides Alexa channel that can be connected to your bot. Just click on Channels item in the left menu and then - Alexa. Configuration screen appears. Here you can customise an invocation name of your skill (the name user has to say to invoke your skill), skill&apos;s locale and the name of the channel. Then you have to click Connect button and grant Aimylogic to build an Alexa skill for you. Once the skill was created, a new channel is added to your bot. You can click on Open Test Console button to test your skill in the Alexa Developer Console. You can also use a physical Echo device under your developer account to test a skill through the voice commands. There is also Reverb application for phones and tables that emulates Alexa&apos;s behaviour and voice. 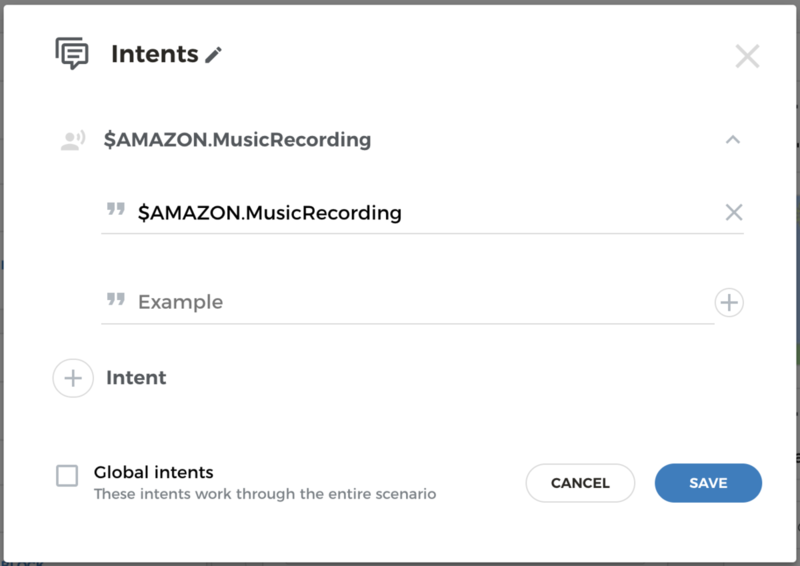 Here we use $AMAZON.MusicRecording slot type as an entity in Aimylogic to extract the title of music track from the user&apos;s input. You can also use your own Custom entities and System entities in your scenarios. You can use SSML tags to create a rich voice response in your skills. Use these tags in the Speech Synthesis Markup field of the Text block. Alexa allows skill to play short MP3 tracks (up to 90 seconds length). But you have to convert your MP3 file previously to the format that is suitable for Echo devices. Please learn how to insert audio tracks in your bot&apos;s response and convert an MP3 files Audio converter. During testing the skill is available only for you. Thus other users cannot interact with your Alexa skill. To make it public please go to the Alexa Developer Console, select your skill and click on Distribution tab. Here you have to provide some data regarding your skill and send it to Amazon review. Once review is passed your skill becomes available for the all users. 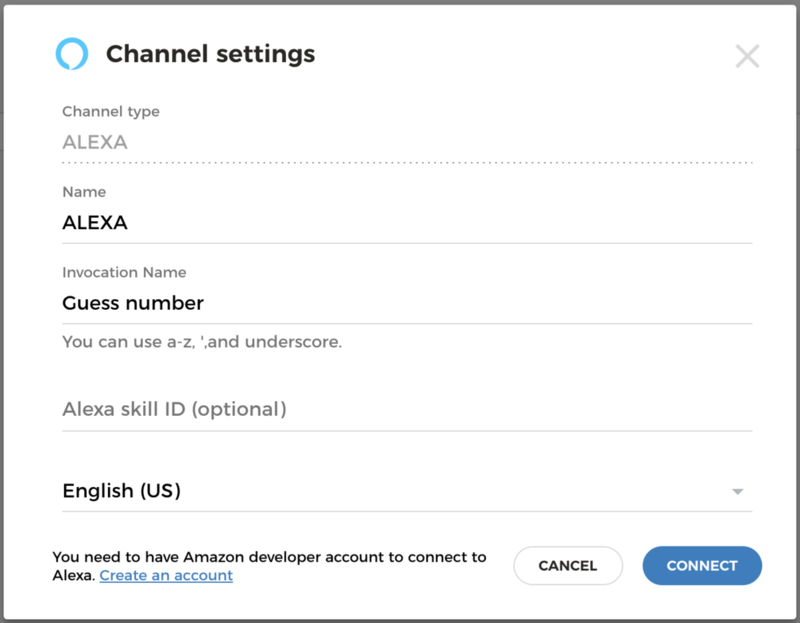 If you&apos;d like your skill could work in other locales, please create a new Alexa channel and provide your skill&apos;s ID in the channel settings. Select another locale, customise an invocation name and click Connect.